The Boston Celtics have their own "splash brothers", according to head coach Brad Stevens. 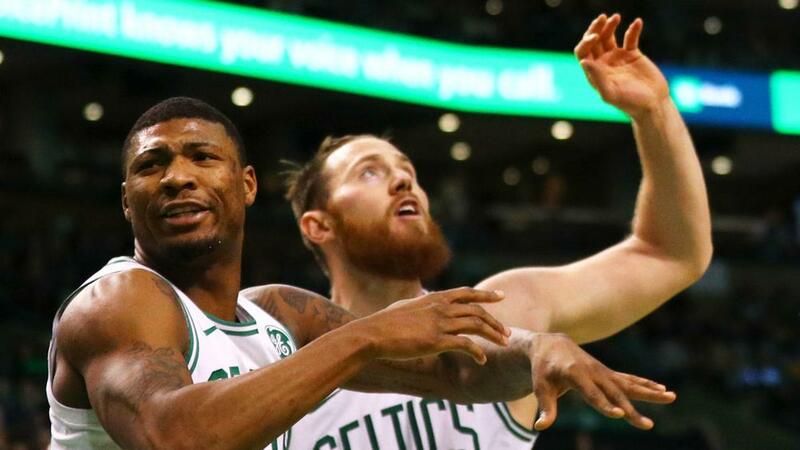 Boston Celtics head coach Brad Stevens praised the shooting of Aron Baynes and Marcus Smart on Monday. The duo tallied 18 points from three-point range in the Celtics' 112-104 victory over the Brooklyn Nets. They combined to make six of their 15 attempts from behind the arc, and Stevens called them Boston's "splash brothers". The original "splash brothers" are Golden State Warriors guards Stephen Curry and Klay Thompson, who the Celtics lost to on Saturday. "Those are our splash brothers," Stevens said. "Baynes probably puts up as many attempts in practice as anybody on our team so it's good to see those go down. "Marcus has been shooting great all year. Every time Marcus lets it go you feel good about it." Smart laughed when he heard about Stevens' comments and acknowledged that he does not quite live up to the Warriors duo's shooting prowess. "We're nowhere near that," Smart said. "We're just taking good shots and making the shots that we get." The Celtics hit 13 three-pointers in all as a team, bouncing back from their last loss in a big way without Kyrie Irving. Both players have been much improved from behind the arc this season. Smart entered the game shooting 36.3 per cent from three-point range while Baynes was knocking down 31.7 per cent of his long-range attempts. "I've heard it [the nickname], but not referring to myself," Baynes said. Boston will face the Charlotte Hornets on Tuesday.